The seemingly innocuous word, “subjects,” in the University of Virginia Board of Visitors minutes from 1832 is actually referring to cadavers used for dissection in anatomy classes. In July 1827, when predicting the completion of the space in the Anatomical Theatre to be used for dissections, James Madison had stated, “there is no room for apprehending a want of subjects.”  Madison’s assumption was far too optimistic. It would be nearly 60 years before the state legislature passed a law that provided a systematic way for medical schools to obtain bodies for dissection. Until then, most cadavers were obtained by body snatching from graves or requesting in advance the bodies of criminals condemned to death. The responsibility for these acquisitions, if not the actual task, fell to anatomy demonstrators and professors and sometimes their students. 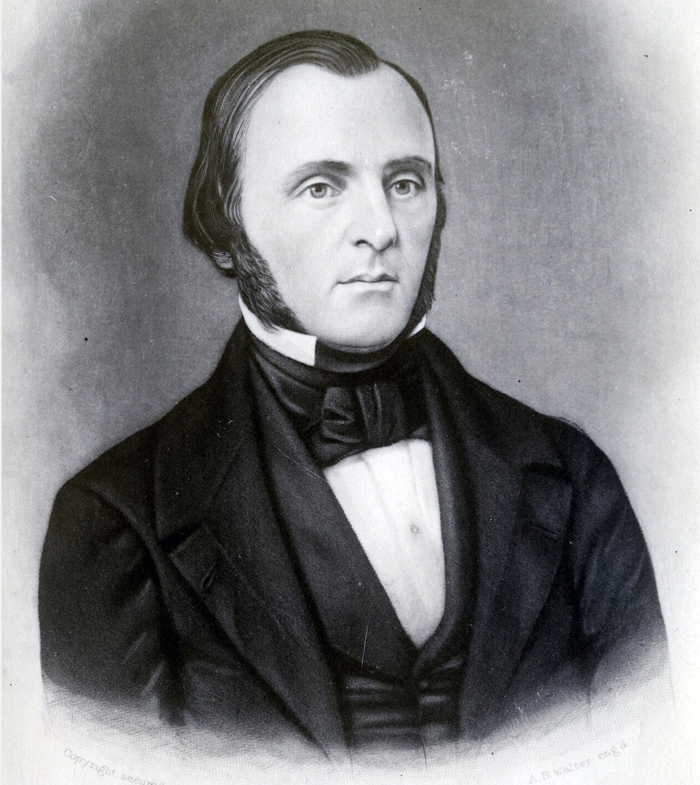 John Staige Davis, Professor of Anatomy, Materia Medica, Therapeutics, and Botany by Adam B. Walter, circa 1859. Prints10069, Special Collections, University of Virginia Library, Charlottesville, Va.
Dr. Davis sought the help of intermediary agents in Richmond, Norfolk, and Alexandria, Virginia, who made arrangements with men called body snatchers or resurrectionists to take cadavers from “the cemeteries of the sizable slave, free black, and poor white populations of Virginia’s leading urban centers,” pack them in bran or sawdust in large whiskey or oil barrels, and then transport the barrels by train from the Richmond-Petersburg area. Davis made copies of his correspondence with his agents, who often had an association with the University of Virginia or the Medical College of Virginia, originally the Medical Department of Hampden-Sydney College, in Richmond. He also saved letters that were written to him, in spite of at least one correspondent pleading with him to do otherwise. 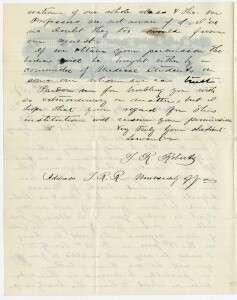 Dr. Lewis W. Minor wrote, “After taking such notes from my letters as you may think desirable, I pray you to destroy them for truly they have not even a respectable appearance.”  These letters are now housed in the Albert and Shirley Small Special Collections Library at the University of Virginia. They give a fascinating glimpse into the role of an anatomy professor in the middle of the 19th century and the difficulties and complexities of obtaining bodies for dissection. Some of these troubles are illustrated below by Davis’s correspondence, prefaced by questions that might have been asked by an anatomist responsible for teaching medical students in the years prior to a legal and standardized way of procuring cadavers. How do you find someone you can trust, but who is willing to commit a felony to disinter bodies? How do you get the bodies out of Richmond when the medical school there is competing for them, too? How do you deal with the vagaries of weather, too hot or too cold? What if there is a shortage of deaths? Or what if there are too many deaths? What happens if a barrel goes astray and is opened as apparently happened in November 1850? How to get acceptable bodies, not ones that are “fat” or “dropsical” without casting suspicion by questioning about the deceased’s body type? What if your resurrectionist is arrested or is no longer interested? James Lawrence Cabell, Professor of Anatomy, Comparative Anatomy, Physiology, and Surgery by Adam B. Walter, circa 1859. Prints16145, Special Collections, University of Virginia Library, Charlottesville, Va.
Several letters in the Davis collection relating to anatomical dissection do not concern the removal of bodies from graves, but to another means of procurement — using the bodies of executed criminals. In 1779, Thomas Jefferson had proposed a bill to the Virginia General Assembly concerning crimes and punishments where he advocated that those convicted of petty treason or the murder of certain family members be hung and their bodies delivered to anatomists for dissection. Not only did Jefferson’s bill fail, but another act that same year prohibited the dissection of executed murderers. However, this did not prevent students or Professor Davis from pursuing this potential source. of the case demands it. on the 18th prox. in Pr. Wm County Va.
some one whom we can trust. T.R. Roberts to Henry A. Wise, January 12, 1857, page 1. Governor Henry A. Wise Executive Papers, 1856-1859, Box 6: Folder 2. Accession #36710, January 14, 1857, The Library of Virginia, Richmond, Virginia. T.R. Roberts to Henry A. Wise, January 12, 1857, page 2. Governor Henry A. Wise Executive Papers, 1856-1859, Box 6: Folder 2. Accession #36710, January 14, 1857, The Library of Virginia, Richmond, Virginia. Dissecting Club, 1906-1907. 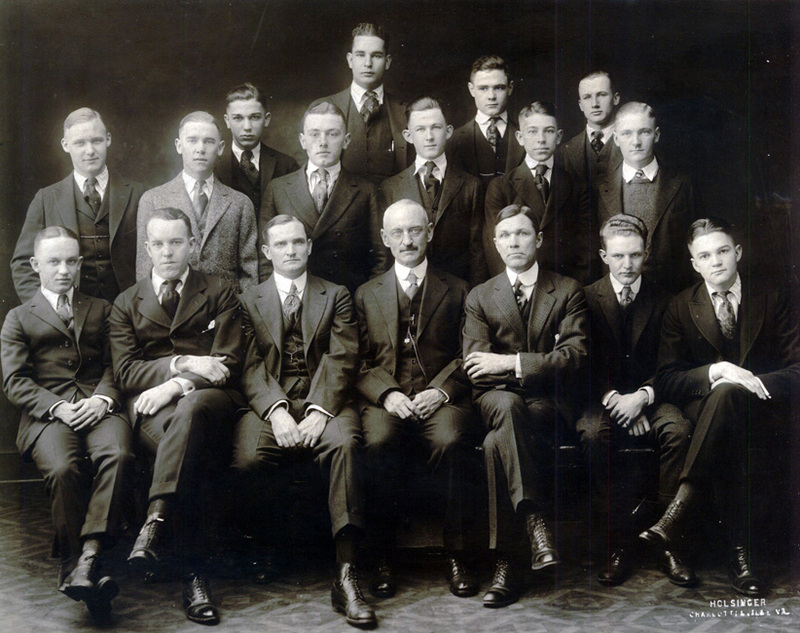 First and second year students studied anatomy in 1907, a year which saw 74 students in those two classes combined. Theodore Hough in the front row, center, was the Professor of Physiology. Prints21241, Special Collections, University of Virginia Library, Charlottesville, Va. The 1896-1897 Catalogue states that practical anatomy, taught in the Dissecting Hall, used “dissecting material, obtained under the permissive law of the State … abundantly supplied without cost to the student.” It also mentions dissecting clubs of eight men each with no more than five clubs admitted to the Hall at one time. The image to the left is titled “Dissecting Club” and was taken by Holsinger’s Studio, the leading photography studio in Charlottesville. Perhaps it is a formal portrait of two clubs combined. Other photos from 1893 to 1909 are in the University of Virginia Visual History Collection and capture University of Virginia students (and faculty) in macabre poses with their cadavers. University of Virginia, Board of Visitors. Minutes, July 10, 1832, 75, Retrieved from http://guides.lib.virginia.edu/bovminutes. University of Virginia, Board of Visitors. Reports of the Board of Visitors to the Literary Fund 1814-1837, 1827: 24. RG-1/1/6. 151, Special Collections, University of Virginia Library, Charlottesville, Va.
Journals of the Chairman of the Faculty 1827-1864, November 15, 1834 and January 14, 1835, Box 2: Volume 5. RG-19/1/2.041, Special Collections, University of Virginia Library, Charlottesville, Va.
Koste, Jodi L. “Artifacts and Commingled Skeletal Remains from a Well on the Medical College of Virginia Campus: Anatomical and Surgical Training in Nineteenth-Century Richmond.” VCU Scholars Compass (June 18 2012): 5. Retrieved from VCU Scholars Compass. Archibald Cary to Septimia Randolph, December 15, 1834. Randolph-Meikleham Family Papers, 1792-1882, Box 1: Folder 59. Accession #4726-a, Special Collections, University of Virginia Library, Charlottesville, Va.; Head, Ronald B. (Ed.). “The Student Diary of Charles Ellis, Jr., March 10-June 25, 1835,” The Magazine of Albemarle County History 35 and 36 (1977-1978): 59. University of Virginia. Catalogue of the Officers and Students of the University of Virginia, Session of 1842-43. Richmond: Shepherd and Colin, 1843, 22. Breeden, James O. “Body Snatchers and Anatomy Professors: Medical Education in Nineteenth-Century Virginia.” The Virginia Magazine of History and Biography 83:3 (July 1975): 326, 327; University of Virginia. Catalogue of the Officers and Students of the University of Virginia, Session of 1847-48. Richmond: H.K. Ellyson, Printer, 1848, ; Acts of the General Assembly of Virginia: Passed at the Session Commencing December 6, 1847, and ending April 5, 1848. Richmond: Samuel Shepherd, Printer to Commonwealth, 1848, 112. Lewis W. Minor to John Staige Davis, November 30, 1850. Papers of John Staige Davis, 1840-1888, Box 1: Folder 1850-1855. MSS 1912, 2842, Special Collections, University of Virginia Library, Charlottesville, Va.
H.L. Thomas to John Staige Davis, September 5, 1849 and September 12, 1849. Papers of John Staige Davis, 1840-1888, Box 1: Folder 1846-1849. MSS 1912, 2842, Special Collections, University of Virginia Library, Charlottesville, Va.
H.L. Thomas to John Staige Davis, September 12, 1849. Papers of John Staige Davis, 1840-1888, Box 1: Folder 1846-1849. MSS 1912, 2842, Special Collections, University of Virginia Library, Charlottesville, Va.
H.L. Thomas to John Staige Davis, November 3, 1849. Papers of John Staige Davis, 1840-1888, Box 1: Folder 1846-1849. MSS 1912, 2842, Special Collections, University of Virginia Library, Charlottesville, Va.
T.C. 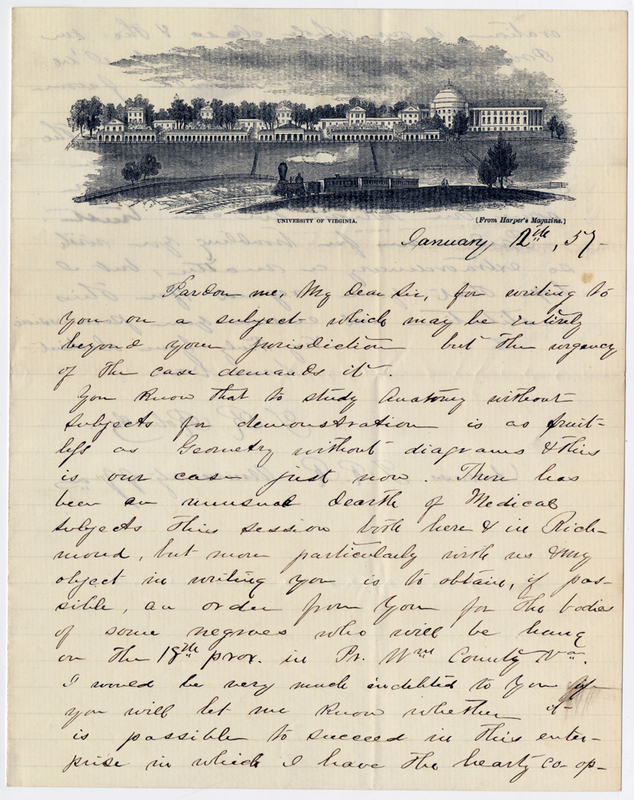 Brown to John Staige Davis, March 5, 1857. Papers of John Staige Davis, 1840-1888, Box 1: Folder 1856-1859. MSS 1912, 2842, Special Collections, University of Virginia Library, Charlottesville, Va.
John Staige Davis to A.E. Peticolas, February 8, 1859. Papers of John Staige Davis, 1840-1888, Box 3: Letterpress book. MSS 1912, 2842, Special Collections, University of Virginia Library, Charlottesville, Va.
Lewis W. Minor to John Staige Davis, November 15, 1850. Papers of John Staige Davis, 1840-1888, Box 1: Folder 1850-1855. MSS 1912, 2842, Special Collections, University of Virginia Library, Charlottesville, Va.
Wertenbaker, Charles Christian. “Early Days of the University.” The Alumni Bulletin 4:1 (May 1897): 24. A.E. Peticolas to John Staige Davis, January 26, 1852. Papers of John Staige Davis, 1840-1888, Box 1: Folder 1850-1855. MSS 1912, 2842, Special Collections, University of Virginia Library, Charlottesville, Va.
A.E. 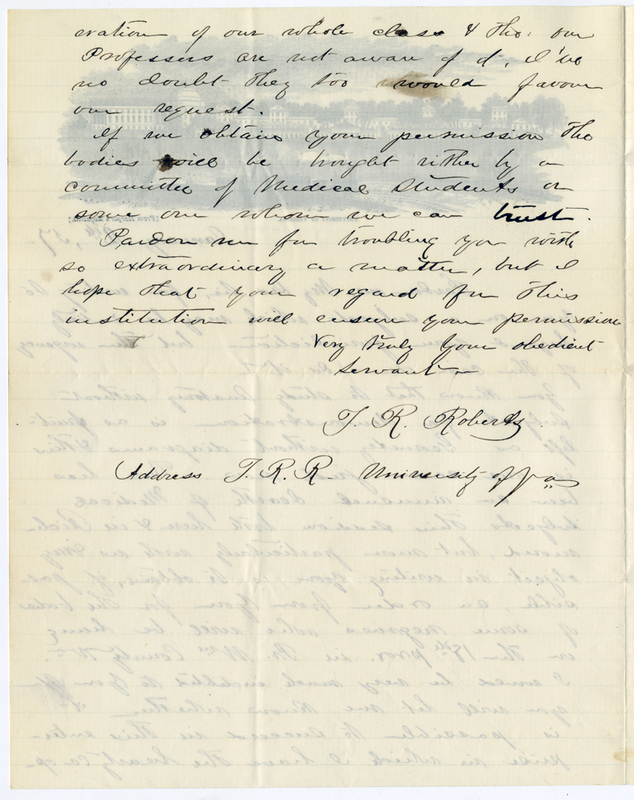 Peticolas to John Staige Davis, January 26, 1852. Papers of John Staige Davis, 1840-1888, Box 1: Folder 1850-1855. MSS 1912, 2842, Special Collections, University of Virginia Library, Charlottesville, Va.; A.E. Peticolas to John Staige Davis, January 21, 1856. Papers of John Staige Davis, 1840-1888, Box 1: Folder 1856-1859. MSS 1912, 2842, Special Collections, University of Virginia Library, Charlottesville, Va.
James L. Cabell to John Staige Davis, July 23, 1851. Papers of John Staige Davis, 1840-1888, Box 1: Folder 1850-1855. MSS 1912, 2842, Special Collections, University of Virginia Library, Charlottesville, Va.
Koste, Jodi L. “Artifacts and Commingled Skeletal Remains from a Well on the Medical College of Virginia Campus: Anatomical and Surgical Training in Nineteenth-Century Richmond.” VCU Scholars Compass (June 18 2012): 9. Retrieved from VCU Scholars Compass. The relevant paragraph in Jefferson’s Bill for Portportioning Crimes and Punishments in Cases Heretofore Capital is, “If any person commit Petty treason, or a husband murder his wife, a parent his child, or a child his parent, he shall suffer death by hanging, and his body be delivered to Anatomists to be dissected.” Thomas Jefferson, The Papers of Thomas Jefferson, vol. 2, 1777 – 18 June 1779. Edited by Julian P. Boyd. Princeton: Princeton University Press, 1950, 494. Hartwell, Edward Mussey. “The Hindrances to Anatomical Study in the United States, Including a Special Record of the Struggles of Our Early Anatomical Teachers.” Annals of Anatomy and Surgery 3 (January-June 1881): 218. Retrieved from HathiTrust Digital Library. 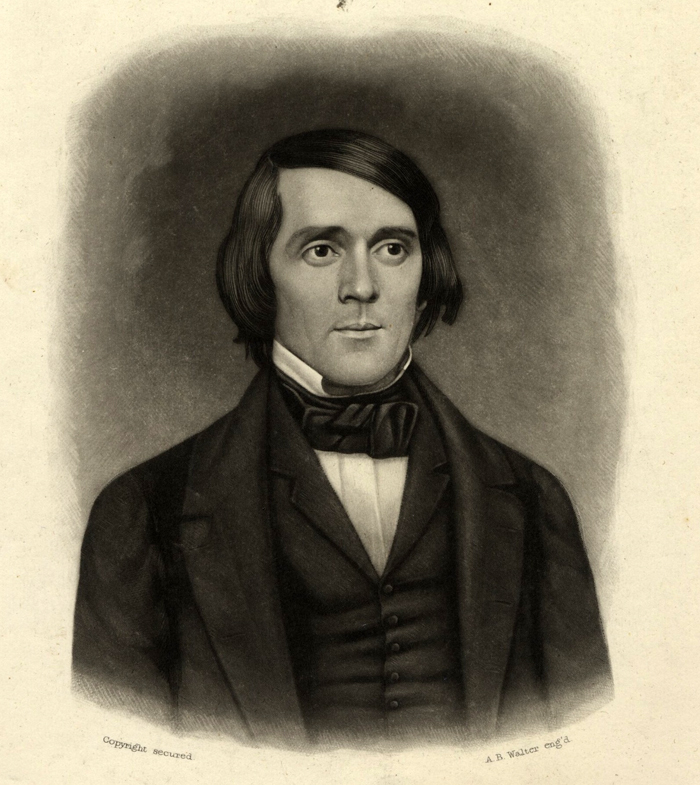 See “The Killing of George Green by his Slaves December 1856” and following documents at http://www.pwcvirginia.com/RonsRamblings.htm. Prince William County Virginia, African American and Slave Records by Ronald Ray Turner. T.R. Roberts to Henry A. Wise, January 12, 1857. Governor Henry A. Wise Executive Papers, 1856-1859, Box 6: Folder 2. Accession #36710, January 14, 1857, The Library of Virginia, Richmond, Virginia. Cook, Abner H. “The Winchester Medical College, Winchester, Virginia, 1827-1862.” The Medical Pickwick 4:1 (January 1918): 3-7. Retrieved from HathiTrust Digital Library; Duncan, Richard R. Beleaguered Winchester: A Virginia Community at War, 1861-1865. Baton Rouge: Louisiana State University Press, 2007, 58. John Staige Davis to C.C. Wertenbaker, December 8, 1859. Papers of John Staige Davis, 1840-1888, Box 3: Letterpress book. MSS 1912, 2842, Special Collections, University of Virginia Library, Charlottesville, Va.
Virginia. Acts and Joint Resolutions Passed by the General Assembly of the State of Virginia during the Session of 1883-84. Richmond: R.U. Derr, 1884, 61-62, 816. Retrieved from HathiTrust Digital Library. John Staige Davis to S.G. Pedigo, January, 9, 1883. MSS 2029, Special Collections, University of Virginia Library, Charlottesville, Va.
University of Virginia. Catalogue, 1896-1897, Announcements 1897-1898. (n.p. ), 108.